I am begging you to pray that if there is catastrophic spiritual ruin ahead of us, that God would open our eyes to it before it is too late. If you have not been praying with heartfelt sincerity and desperate dependence on God – start tonight. 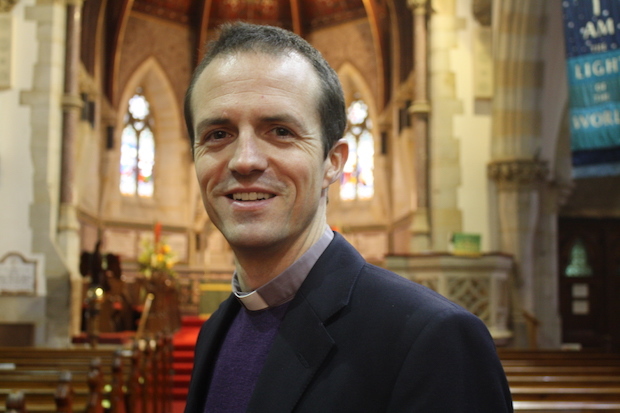 Dr. Sanlon, who is Vicar of St. Mark’s (Church of England) and Rector of Emmanuel Anglican Church (Free Church of England), agreed to an e-mail interview with me about his views. The transcript is as follows. I strongly encourage US Christians to pay close attention to what he says. What British Christians are living with today, American Christians will almost certainly be living with tomorrow. We have the advantage of time to prepare — though not much of it. Dr. Sanlon, you’ve mentioned to me that the situation for faithful small-o orthodox Christians in the West today is a lot like passengers on the Titanic refusing to believe that the ship is sinking. What do you mean? The Titanic was believed to be the ‘unsinkable ship’ – yet 1,503 souls perished in the icy Atlantic waters. The designers, financiers, media, crew and passengers held that the ship was unsinkable — and therefore were unable to consider or prepare adequately for her sinking. People are shaped and formed by their beliefs: if you believe something cannot occur, you will not think about it or prepare for it. This is all the more true if the thing you believe cannot happen is something that would be deeply unpleasant to you. The human heart has an astonishing capacity for self-deception, and together with those who are similarly disposed we have almost infinite abilities to participate in mass delusion. Consider how the shudders of the Titanic liner impacting the iceberg were dismissed as insignificant. Those down in the hull of the ship could see water pouring in — but those in the restaurants and cabins above them would not believe warnings. Those bringing the warnings were uncouth, less cultured, not as intelligent — and crucially theywere bringing warnings of tragedy that were unpalatable. The mind rationalizes what the heart desires. What then do I mean when I say that orthodox Christians in the West are like passengers on the Titanic? I mean that the Church in our Western nations has already hit the iceberg. Water is flooding into the hull — the ship will sink. The grinding judders of our ship impacting the iceberg have been felt — but the majority of Christians will do what the Titanic passengers and crew did — explain the evidence away and refuse to help one another prepare to save one another’s spiritual lives. The iceberg that has has ripped open the Church is composed of not frozen water, but three things. Radical sexual gender ideologies, Islam and governments’ totalitarian instincts. Why is it that these three movements are so certain to sink the ship? The reason is that the mainline churches in the West are deeply compromised. Over many decades our leaders have fostered the hope that by political action, legal efforts or even by embracing the cultures’ ideologies in these three areas, that it can prosper or survive. This has severely weakened the Churches and leaves us unprepared for the future. One final point about the Titanic. People said at the time that ‘God could not sink her.’ They believed that God was on their side due to their technological ability and cultural superiority. The ultimate reason for refusing to believe that God would remove our positions of security, privilege and cultural acceptability is that we think God is on our side and could not do it. Well, such spiritual pride is often met by God with his humbling judgement. Help American readers understand what the situation looks like for UK Christians. It is hard for many of us to imagine that the country that gave us C.S. Lewis and J.R.R. Tolkien could have turned so hostile to the faith. It is important to explain that I do not believe the Church itself — in the sense of God’s people — will be sunk. What I do mean is that the public, easy, culturally acceptable way we do church is sunk. We face a situation where, short of supernatural intervention, the Church is moving into exile. How has such a situation arisen? It is a complex story – but in essence Britain secularised 20 to 30 years before the USA. When Ronald Reagan talked about his faith it was viewed as bizarre in England. Today the political commendations of Billy Graham given in America would not be given in England. This means that we now have people in leadership positions who had their entire schooling and formative lives lived out under a regime of full-blooded acceptance of radical deconstructionist ideologies. It is always the case that societies have many people who reject the beliefs of Christians. This is different. British people in their sixties recall that when they were twenty, many thought Christians were ignorant due to their ‘unscientific’ beliefs. Today, people in their twenties think Christians are not ignorant, but evil and dangerous due to their inability to commend the radical sexual ideologies, Islam and further government control of life’s details. People who are evil must be silenced, protected from themselves and prevented from infecting others with their beliefs. The UK is not only ahead of the USA on secularisation; it has always been more left-leaning than America politically. There is a spectrum of right and left in both cultures, but as the editor of The Economist explored a few years ago, the UK shifts the spectrum of possible political views several notches towards the left. So a view held to be ‘right wing’ in the UK could be thought of as let wing in the USA. This research is detailed in The Right Nation by Adrian Wooldridge. A consequence of this is that the UK is ahead of the USA in seeking to use state apparatus to enforce cultural norms that would be rejected by American libertarians. Such moves are done with the support of many in the British population. On the final day of LGBT+ history month it’s important to remember that LGBT+ history is all our history. LGBT+ success is everyone’s success. And LGBT+ rights are human rights. Theresa May is lauded as the daughter of a Church minister. No wonder people are confused as to what the Church believes when leaders are silent or promote the world’s views. Flags are flown in universities, councils, fire stations and schools to celebrate the new radical ideologies. To even ask how to question the rightness of that has already led to people facing investigations and discipline from their institutions. The movements for acceptance have now allied with the totalitarian instinct and become views which are to not merely be tolerated but to be celebrated. I’ve been told by a British reader that Evangelicals in your country are especially resistant to facing these harsh realities. Is that true? If so, why? I believe it is the fallen human heart that is resistant to the challenges facing us — but they do manifest themselves in Britain in particular ways. As the compromised Church moves to suppress faithful ministry, we see that those Titanic passengers who are in denial, painfully turn on their friends and colleagues who suffer. So there are currently a number of clergy in the Church of England undergoing disciplinary procedures against them for upholding plain Biblical teaching in areas that the culture finds offensive. Bishops have told clergy that unless they submit to the situation they will face discipline. Some are currently facing that and others have done. In other words the orthodox ministers are standing on the shore of a beach. A tidal wave is sweeping inland and it knocks somebody to the ground a few feet away from you. But instead of accepting there is a tidal wave coming that will drown you also – you tell yourself that your friend drowned because of his attitude or posture. Apathy: People busy themselves with limited areas of faithfulness and find it difficult to engage with the larger cultural challenges. Boredom: The same problems keep coming up — it just seems intractable and boring. Comfort: Many clergy are actually in the UK very comfortable in homes and church buildings provided by their denomination. Once we assume they are our right it is very difficult to give them up. Denial: I repeatedly hear from people in England that the serious analysis of the problems we face is accurate and irrefutable — but its not as bad as that. Nobody can ever explain how the analysis of court cases, church statements and media stories as it is — but does not lead where the evidence seems to lead. It is just denial, of the Titanic stripe. Establishment longings: Evangelicals in particular pride themselves on being radical, anti-establishment sorts. In reality in England many are actually deeply shaped by the Establishment. They entered ministry assuming the establishment blessing of yesteryear would continue for ever, and as the evidence shows that the establishment has turned against Christianity with ferocity, they cling to the hope that they can find a place of safety within that establishment. Perhaps by being quiet, winsome or striking a political deal. In reality the only quarter that will be given is that which is necessary to beguile as many as possible into complacency. Fear: People see the way they will be excluded from polite society if they publicly uphold Christian beliefs — and they fear it. Parents fear how their children will be treated, employees fear disciplinary procedures. Clergy fear being isolated from the main line denominations. It is important that orthodox believers analyse the reasons they are tempted to deny the nature of the challenge faced by the Church – we face powerful ideologies allied to governmental force and compromised mainline denominations. The forces arrayed against real Christian belief are an echo chamber. So a civil servant told me how frustrating he finds it to see that LGBTI campaigning groups receive taxpayers’ money — and they are then consulted by the government on how to improve the issues they campaign upon, and then paid to deliver the training they say addresses them! One cannot get much more of an echo chamber than that. The consequence is that the views are every more deeply ingrained. Doubtless the fruit of similar alliances will be seen in America in the coming years. One can analyse all this from a psychological and political standpoint – but in the end believers need to wrestle with the spiritual realities. We need to pray, ponder scripture and relearn what it means to be a Christian community that suffers, is marginalised from the mainstream culture and shares a quality of supportive love together. What lessons have you learned from your work as a pastor in rapidly secularizing Britain that could benefit American Christians, who are headed down the same path? Very few orthodox churches in England are seeing people become Christians from total secular backgrounds in their twenties and thirties. The vast majority of converts are those who have had some Christian background. Studies from secular Europe (See Church Planting in the Secular West by Stefan Paas, p.162) suggest that on an optimistic reading of the research, for every 400 converts who had some background Christian faith, only one person converts from the full-blooded secular background that now makes up the majority culture of England and Europe. I have friends who lead healthy vibrant evangelical churches – but over the past decade they have noticed that their congregations are made up not of native secular English people, but primarily Kenyan, Polish and South African people — that is people from less secularised nations than our own. They rejoice in the cultural diversity of God’s family, but are pained that they seem almost unable to evangelise secular English people. So the first lesson I have learned is that it is very, very difficult to see a native secularist — somebody in their thirties who has all their life been raised to imbibe strong versions of the secular postmodern ideology — convert to Christianity. I have seen many many people explore the Faith, but as soon as they discover the gulf between postmodern secular views and Biblical belief, they run a mile and/or get angry. Some secular parents in England still want their children to attend church occasionally – but they are outraged that some churches do not view their secular beliefs as true. Our models of church are simply not designed to cope with this. Another key lesson is that orthodox Christians are going to have to work hard to come to terms with the speed at which governments are beginning to legislate against Christian beliefs, and the way that is intertwined with views of Islam. In the UK we see this manifested in the PREVENT Strategy, a government project to address ‘extremist’ beliefs. Extremism is defined very vaguely, such that it can catch up not just Islamic terrorists, but also Christian parents, Jewish schools and even people who take certain views on global warming! Rod Liddle wrote about the insanity of this situation this week, but of course it has been detailed before, in George Orwell’s novel 1984. Last week the head of Scotland Yard said that courts should remove children from extremist parents That’s a terrifying thought given how unclear the government seems to be about what extremism is. The head of OFSTED (government schools inspection body) has accused a mainstream evangelical organisation of being extremist. The government protests that its laws do not do what they manifestly in point of fact do – allow people to report people to PREVENT for all kinds of disagreements over matters of faith, belief and opinion. Some of these cases have been carried far too far, causing untold stress and anguish. They never should have been brought — and that they can be, itself further changes the cultural expectations as regards freedom of religion and freedom of speech and association. Some proposals such as the registration of church ministers and the government inspection of Sunday schools are as yet unimplemented. But they will be raised repeatedly until delivered. In the UK we are on the cusp of seeing homeschooling registered with the government by some means. That will begin a further process of control and checks that will bring new pressures for many. Christians need to realise that the law is no longer on their side. Part of that means recognizing that while some laws may technically be on your side – it does not mean laws will be applied or administered with fairness. Finally, I have realised that somehow it will be necessary to keep the communication up with those Christians who cannot bring themselves to accept how much Western culture’s changes will overwhelm the Church and ministry models. The people who are believers but close their eyes to the iceberg are good people who love the Lord. And they will need support and help in the future as things get even more difficult. In my Benedict Option work, I’ve advocated for orthodox Christian believers to start forming tight, strong networks now, across denominational lines and international borders, to prepare for hard times ahead. What kinds of concrete suggestions can you give to this end? Christian ministers must look to the future. They must know both the times and the Bible, for they are organically inter-related. If you do not know the times you will misapply the Bible. Christians in the West as they come to accept the immensity of the cultural shifts need to learn to own the Biblical word for what we are entering. Historical illustrations such as the Titanic (or the Dark Ages or historical seasons of totalitarian rule in Russia etc) can take us only so far in our understanding. We must appropriate the Biblical image: Exile. The first step believers must take is help one another to accept the reality that Exile is coming to the Western Church. Pretty much everything we have seen about how to plant, manage, fund, grow and lead churches is going to have to change. People’s expectations of career for themselves and their children will have to change. People’s commitment levels to church will have to change. Helping one another be open to the reality of Exile and its implications is the first step. I know of people who are developing friendships with believers who presently have more experience of these things, and I know of many who are spending hours reading about how the church has survived in previous ages that had similarities. Secondly the Church must accept that the Exile could well last centuries. The Iceberg has struck the ship and the fatal hole below the waterline cannot be sealed. But the outworkings of that and the full suffering of Exile is far from complete. The Egyptians and Babylonians had many ways to increase the suffering of God’s people: more bricks with less straw, a newly built golden statue, and the lion’s den. Our Exile will not be identical to the past Exiles – but it is clear in the Bible that Exile is often multi generational. The cycle plays out from parents to children to grandchildren to great-grandchildren and beyond. strengthen one another’s faith. Seek to find ways to do church that could outlast sudden changes in the acceptability of Christian meetings, financing and speech. They will be needed. You are fairly young — 40 years old, I believe. Do you discern differences between the way Christians of your generation perceive the future of the faith in Britain, and the way older Christians do? In France, the main audience for my book The Benedict Option has been 18-to-35 year olds. Traveling there to promote the book, I’ve been quite struck by how those young Christians don’t appear to harbor any illusions about fitting into mainstream society. It seems oddly freeing to me. Are you seeing something similar in the UK? many believers unable as yet to accept the cultural reality you write of in The Benedict Option. In short, there are more believers in England but they are less open to accepting the marginalisation and implications of Islam that European Christians are cognisant of. Within England there are then (with exceptions) noticeable patterns of age. In church ministers who are ten to fifteen years off retirement I find many just hope they can get through to retirement age withoutany big problem or radical change to their situations. This embeds the willful denial that anything is dangerously amiss, as younger men look to the older men for a lead. They are too often told in effect to settle down and enjoy the Titanic! A few such ministers have confessed their fear to me – and thankfully there are exceptions to the timid! Meanwhile young trainee ministers in their twenties are torn. They can see that the culture is deeply hostile to their beliefs — they have been raised in it and converted out if it when younger — but this is in tension with their desperate desire to believe that somehow it will be OK for them. If they are winsome enough they will get a good job from which they can serve a church. They look for those who would show them how to prepare for the difficult future they fear and find few able or willing to — and they find numbers of men close to retirement only too keen to reassure them as a form of self-reassurance. There are exceptions to all these generalisations. I am aware of them. Still the patterns seem sufficiently oft-repeated that they bear stating. We desperately need more people willing to help build up long term solutions for training and delivering effective missional ministry in the Exile situation we are entering. Strategists, organisers, funders and pray-ers. All are needed. The Tory MP Jacob Rees-Mogg recently gave an interview in which he urged fellow Catholics not to shy away from getting involved in public life. One may well admire his courage, but there is the depressing example of former Liberal Democratic Party leader Tim Farron, who has spoken about how spitefully he was treated by some over his Christian convictions. What kind of future do committed Christians have in the British public square? Many American Christians — most especially white Evangelicals — have given Donald Trump a full-on embrace, in hopes that he will return America to its Christian past. Others voted for him in spite of his many faults, not out of an expectation that he would be some sort of savior, but out of conviction that whatever Trump’s sins and failings, he would not be aggressively hostile to traditional Christianity. My belief is that whatever one thinks of Trump, Christians would be foolish to place hope in a political solution. Indeed, the great failing of Christian conservatives over the three decades has been to focus their efforts on winning political and legal influence, even as the culture shifted radically towards the left. What do you think? The challenge facing the Western church is far, far bigger than one of human politics. I do not know much about the current American president or his policies, but in the UK we have a political system deeply rooted in Christian freedoms, principles, and in addition we have a Prime Minister whose father was a church minister. As the American Constitution preserves certain freedoms, so the Magna Carta says that English government must uphold the freedom of the English Church. For us all this is utterly irrelevant and has not helped us because the forces arrayed against the church are spiritual and have already irretrievably poisoned institutions at the heart of schooling, college, health care, human resources, media, law and government. Next articleDiscombobulated by Welby? You will be!